This gloomy painting takes on cool blue tones characteristic of Picasso’s early Blue Period works and a subject matter emblematic of his Rose Period. By 1905, clowns and circus folk were a common theme in his work. 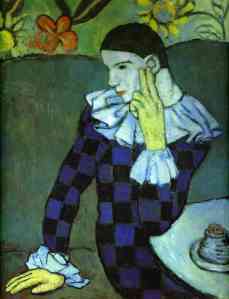 Picasso’s use of broad, flat planes of color and thick outlined shapes seem to hint at a Fauvist influence. Was Picasso borrowing from Matisse already without having been formally introduced? Most often Picasso's works from this period portray impoverished street people as he attempted to portray the real Paris, perhaps. It is suggested that the mood of this picture, and others at the time, reflect his emotional state after the suicide of his friend and fellow artist Casagemas.